The Fall Creators Update ('rs3', i.e. 'Redstone 3', at least in name) is the 'production' branch of Windows 10 Mobile, and these are regular 'Patch Tuesday' fix round-ups for it, with the official list for 15254.527, the '2018-08' update' mainly composed of minor fixes and security patches, at least in terms of mobile relevance. Other branches have updates either rolling out or imminent. As usual and as per the graphic above (the rectangles in a shade of red), all other supported Windows 10 Mobile branches are getting updates too, so all those older phones (Lumia 930, 830, 735, 640, etc.) finishing life on the Anniversary or Creators Update (if the user was smart enough to use our (ahem) hack!) aren't losing out on the core security fixes, at least. 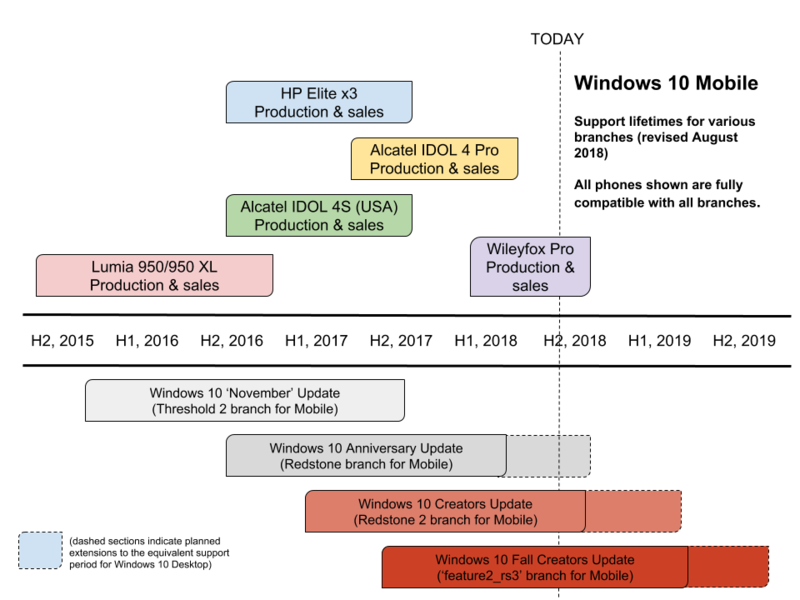 You'll spot from my diagram that we're nearing the end of the update schedule for phones on the Anniversary Update still - meaning that the hack will soon become rather more de rigeur for anyone who cares about absolute security. As usual, in today's vulnerability-stricken, malware-strewn and fraudulent times, we should never disregard security fixes (e.g. to the Edge browser) though, so update today in all affected mobiles, just in case! In each case you get the core security and component updates, though obviously without any subtleties in functionality introduced in later branches for Desktop or XBox. As ever, with all phones, head into Settings/Update & Security/Phone update in order to get the update immediately.